This tapestry 'Symphony in Red & Khaki' is based on the work of artist Laurie Maitland. This work is abstract in nature and features elements and colors in earthy and rustic tones. Maitland studied photography, drawing and set design in London and this background formed the basis of her own independent work as an artist and her works have been acclaimed internationally. Her work here feature a background wash to establish mood and a contrasting element often in the foreground as a counterpoint. 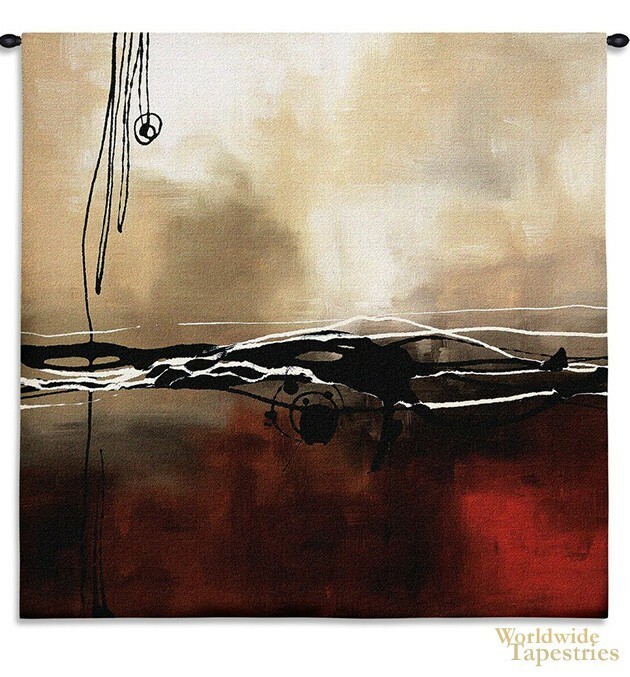 This tapestry is backed with a lining and tunnel for easy hanging. Note: tapestry rod and tassels, where pictured, are purchased separately.